How much do I love all of these pictures? I will have to start thinking about how to put them in my kitchen window without my husband saying anything! LOVE IT! They are nice change from the 'ordinary'. Great post! Very cute... especially in fun fabrics! shoulder pads and cafe curtains! everything old is new again. I am thinking of putting some in my dining room! Wish I had done these in my kitchen instead of roman shades b/c we have to stand up on a chair every time we want to putt the shade up and down. I've seen pictures of these and think they are a great idea! I remember doing the same thing. My nose used to wrinkle at light pastel colors on walls. HAHA...my whole house is pale grey and white now. I have slowly learned to never say never. Oh, and I too have grown fond of cafe curtains. I would definitely use these in the kitchen. Not so much in the living room. In simple patterns and warm colors. Thanks for sharing these! 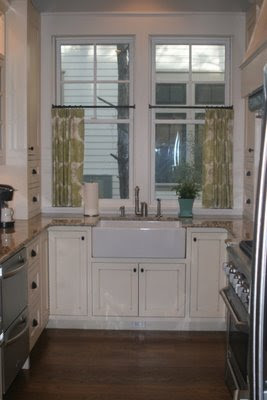 I want to make some for the two windows in my kitchen... just have to find some fabric that I like (can afford). I'm not ready for the cafe curtains yet...maybe in a country cottage type setting, but that just isn't my style. I like something that looks a little more tailored. i am leaning towards these for the window above my sink...now just trying to find fabric. 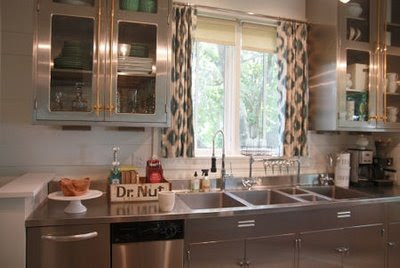 Adore the stainless steel kitchen with the ikat curtains...envy! Congrats on the'mommydom'! It's been 3 years for me now; TWINS! And as a designer, you want to jump, but as a mommy, you want to slow down and snuggle! It's not easy to turn it off, and at the same time it's amazing how your mind switches gears and your imagination is transformed to a higher level! Cafe curtians rock! In fact, I'm getting ready to introduce them into my own kitchen/dr! 'Mosaic' style!